As and when we encounter difficulty while using a food delivery service, the first thing most of us do is a bug the company customer care until they sort out our problem. But talking with customer service can be an irritating experience. It becomes a continuous back and forth between computerised voices, hearing to some god-awful background piano tune for an hour before you give up and cut the call. The funny conservation left the Internet in cracks. We’re too sure that not most of the people demand customer care executives say ‘Maa Kasam‘ when requesting for a refund. Zomato: You’ll have to place a new order, sir. OP: What about the money I paid? Zomato: It will be refunded to you in 4-5 business days. OP: What if it doesn’t happen? Zomato: It will sir, don’t worry. OP: Thanks. I received it. 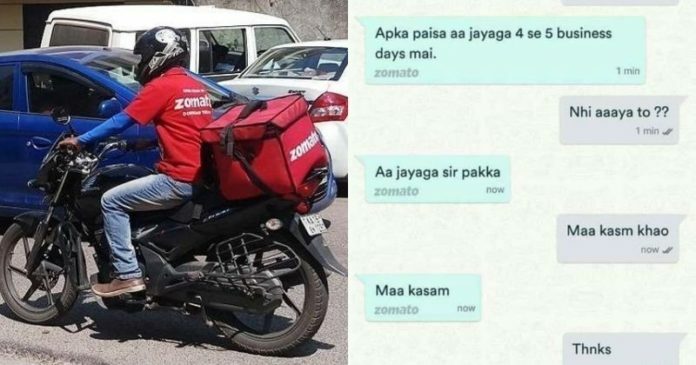 This is not the first time Zomato’s officials and their communications have gone viral on social media. 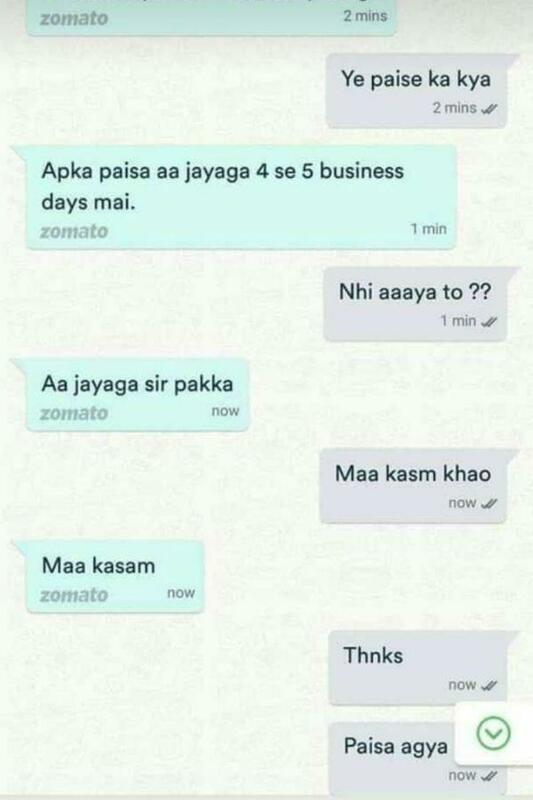 Back in 2016, Pankaj Chaddah, the co-founder of Zomato, shared a snap of a conversation a Zomato user had with an executive and it was straightforward hilarious! Recently, Zomato came under fire for a video that revealed a delivery executive eating from the boxes of food he was assumed to deliver. Zomato promptly issued a statement condemning food-tampering and stating that the concerned person has been dismissed. They also said to implement tamper-proof packaging so that such disturbances are not repeated in the future.